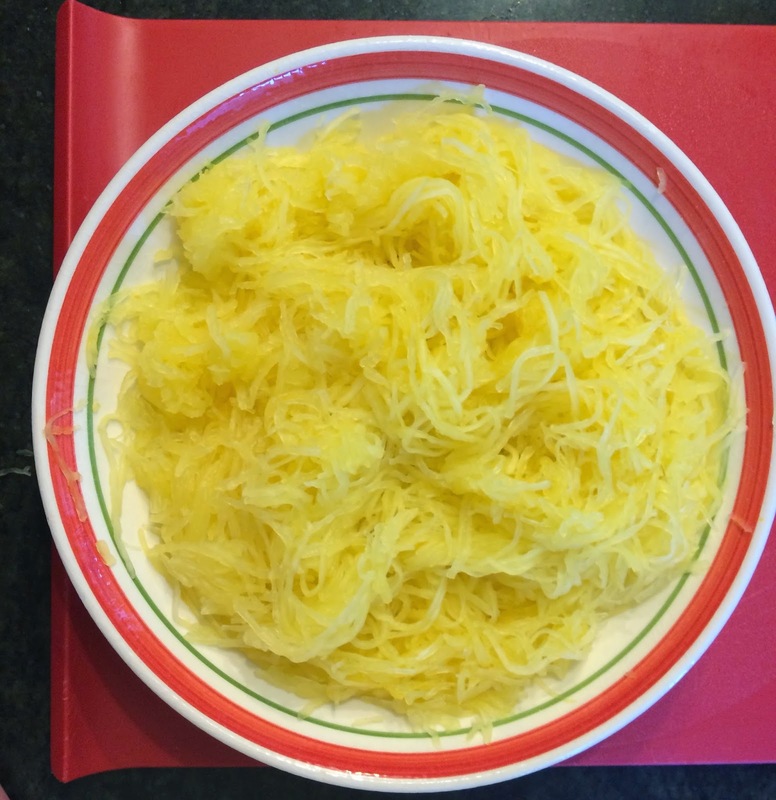 Have you ever tried spaghetti squash?! I've been intrigued by this pasta imposter (impasta!) for quite some time so decided to finally test it out for myself...and it was delicious! As it was probably the priciest vegetable I've ever purchased (over $7! ), I reallllly didn't want to eff up the cooking of it, but thankfully it turned out perfectly. I was afraid that the strands would be really mushy, but they actually had a great bite to them, and the bland flavour pairs well with any type of sauce. Obviously, it doesn't taste quite the same as real pasta, but at 1/5th of the calories, it's a pretty good trade-off. 1. 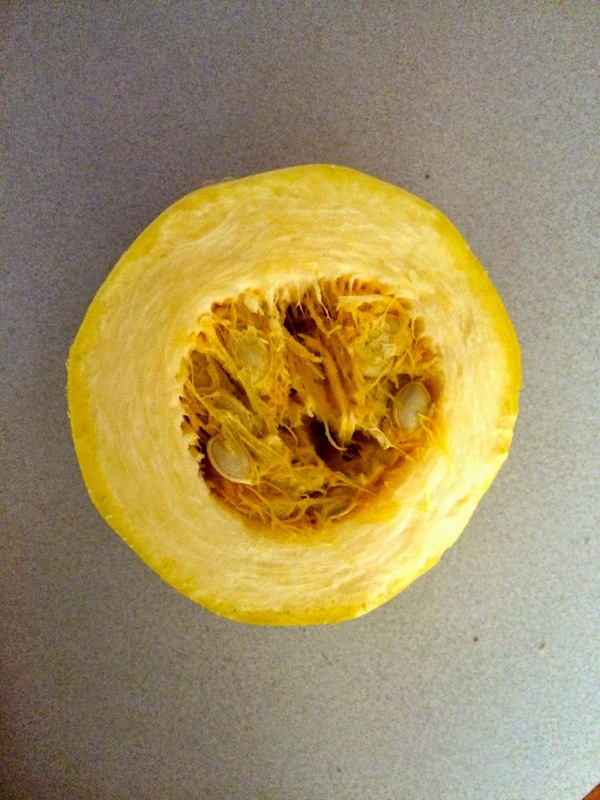 Cut the squash in half (lengthwise for shorter strands; widthwise for longer ones -- I did the latter). 2. Scoop out the seeds and pulp. 3. 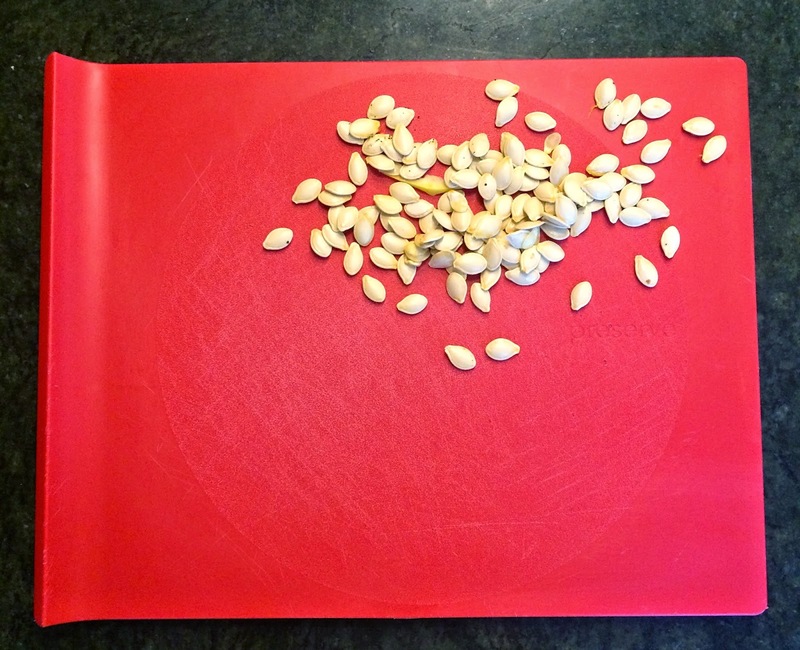 Place the halves (cut-side down) on a plate and microwave for 12 minutes. 4. Scrape out the inside with a fork (the fun part!). 5. Serve with your sauce of choice -- I opted for a pre-made alfredo sauce. So there you have it -- a healthy and simple meal in minutes! I was pleasantly surprised at how filling spaghetti squash is (I felt just as satisfied after a bowl of it as I would have with the same amount of the real deal). And there's so much of it too -- definitely more than enough for two hungry people, and could easily feed up to four. Despite the fact that I love a good red carpet (I practically count down the days to the Golden Globes and Oscars each year), the Met Gala has never really registered with me as an event to get excited about. Each year, it'll come and go and I'll give a cursory glance to the fashion of the night and then completely forget about it until it rolls around again. But I felt there was something different and way more outrageous about it this year...and like EVERYONE in Hollywood was there! Why has it never dawned on me that pretty much everyone who's anyone goes to this?! With the theme being "China: Through the Looking Glass," there was a definite Oriental vibe to the majority of the night's looks, and the fashion bar was raised to a higher-than-usual standard of WTF-ness. Here are my thoughts...I'd love to hear yours! I'm pretty boring when it comes to hair (most of the time I just wear mine down), but I love the polished yet easygoing look of a low ponytail. I've always loved the look of a bright pink lip (NARS' "Schiap" is one of my go-to lipsticks), and apparently this Barbie-esque style is right on trend this season. I'm not a big nails person (I bypassed the whole nail art thing completely), but this neutral look is one I can get behind. The models at Fendi actually sported strips of pastel-coloured leather on their eyes -- not exactly a look I'm willing to commit to, but I do think a swipe of mint green or powder blue liquid liner would look equally fresh. I love the minimalist look of a simple metallic hair accessory a la Céline's gold circle clip, but even just a few well-placed gold hair slides would give the same sleek vibe. 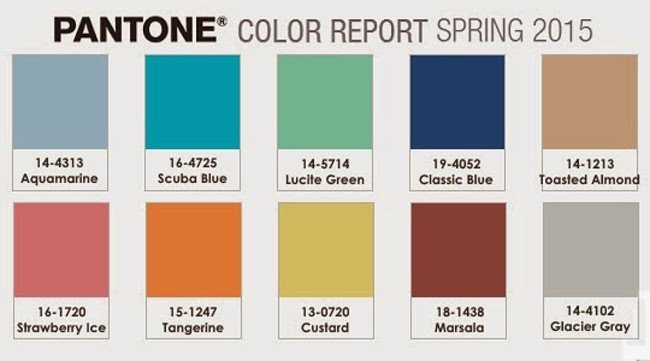 As you may have guessed by now, I'm pretty much obsessed with colour and I always look forward to seeing which shades Pantone select for each new season. Which of these hot hues are you most drawn towards?! I'm loving the retro vibe of Lucite Green myself, and I think Toasted Almond may just be my new favourite neutral. Sephora's birthday gift this past month was a good one: two decent-sized NARS lip pencils, one of which, Cruella, I thought I'd showcase for this LOTW. Described as a "passionate scarlet red," it's the perfect shade to wear when you want to toughen up a sweet outfit, and I'm a big fan of its matte finish. At first, I thought it seemed a bit, well, dark (even by my standards) when I applied it, but it wears to a beautiful wine colour after a few hours and didn't need a single touch-up throughout the day. 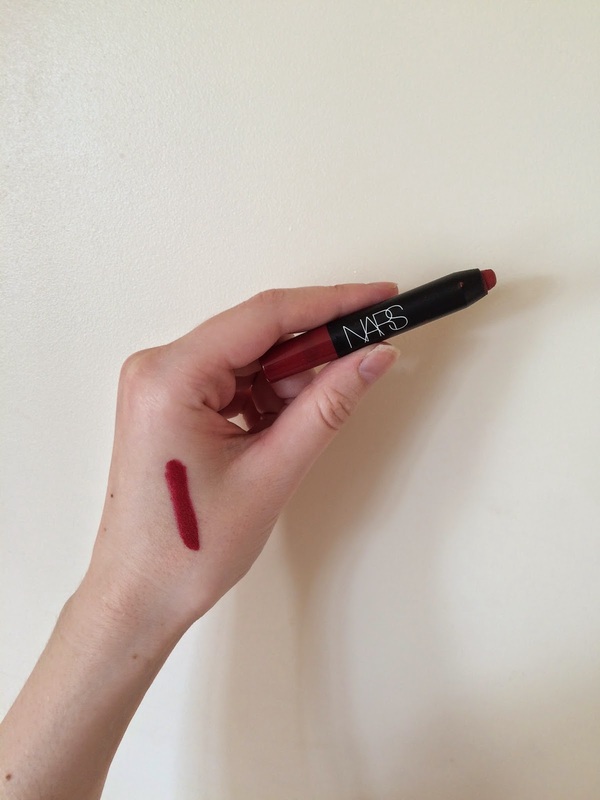 I recently raided Vicky's lipstick collection and unearthed this little beauty: NARS' Bolero, a lip pencil in a Velvet Matte finish. 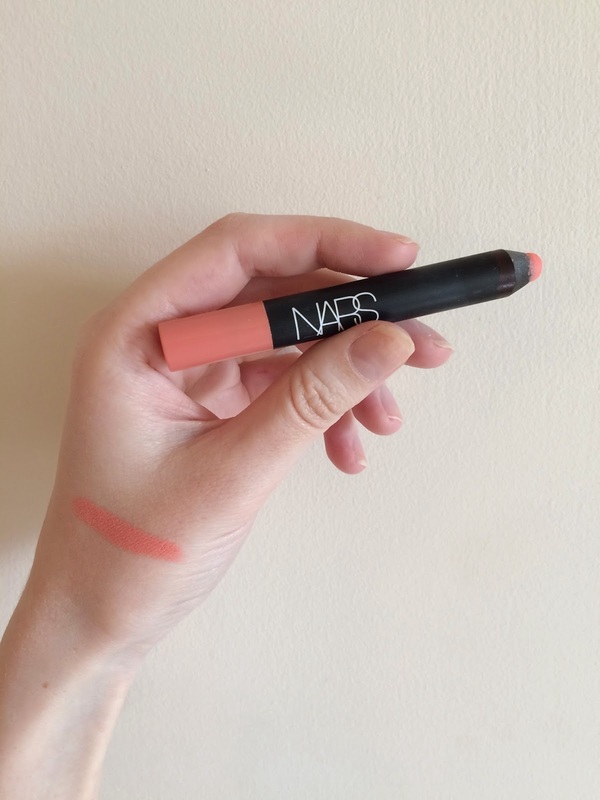 A light peachy-pink colour (described on the NARS website as "pink cantaloupe"), it's a far cry from my favoured bright/intense shades, but it feels perfect for this time of year -- very springy and fresh. And I love that because it's so soft, I can pair it with a more defined, smoky eye. A word of warning, however: it is very drying (even more so than other Velvet Matte pencils I've tried, for some reason), and can easily look cakey/flakey if you haven't exfoliated well beforehand. Also, the swatch on my hand is somewhat misleading; on my lips it's definitely not quite so vibrant a colour. When it comes to fashion, there are some trends I bypass entirely (ie. culottes), and some I latch on to right away (ie. crop tops). This little white top from last summer made a return appearance for our trip to Cuba, this time paired with one of my favourite skirts ever, a midi/maxi (mixi?) I picked up in a post-Christmas Anthro sale. I love long skirts but I often find it tricky to decide what to wear them with -- so often, a tucked-in t-shirt can look kind of awkward when it bunches up around the waist, I find. So thank God for crop tops! And I love that this plain white one is the perfect backdrop for a big, statement necklace.